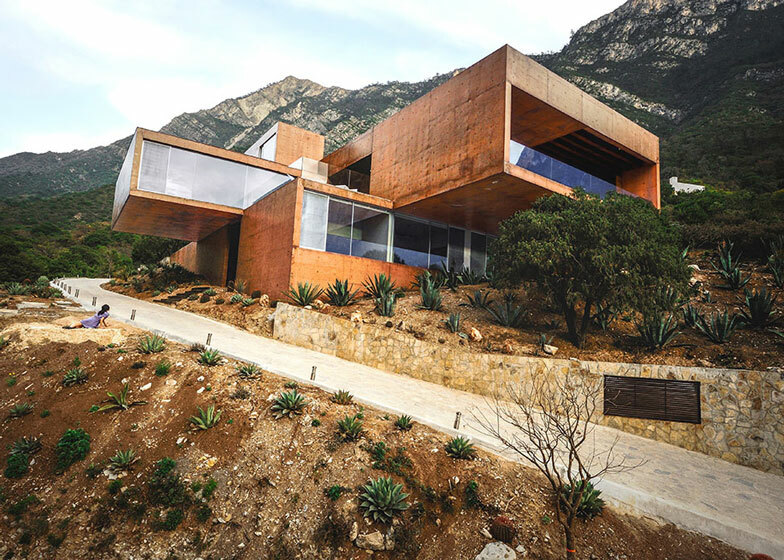 The mountain landscape of coastal Mexico provides an idyllic setting for this red concrete house by Mexican architect David Pedroza Castañeda (+ slideshow). 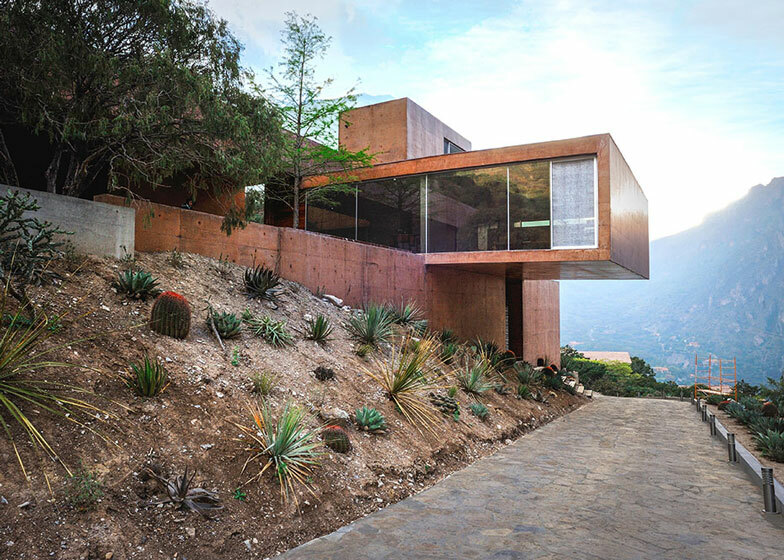 Comprising a series of overlapping and cantilevered volumes, Casa Narigua thrusts horizontally out from the hillside in El Jonuco, north-west Mexico, forming a secluded home above the treetops. 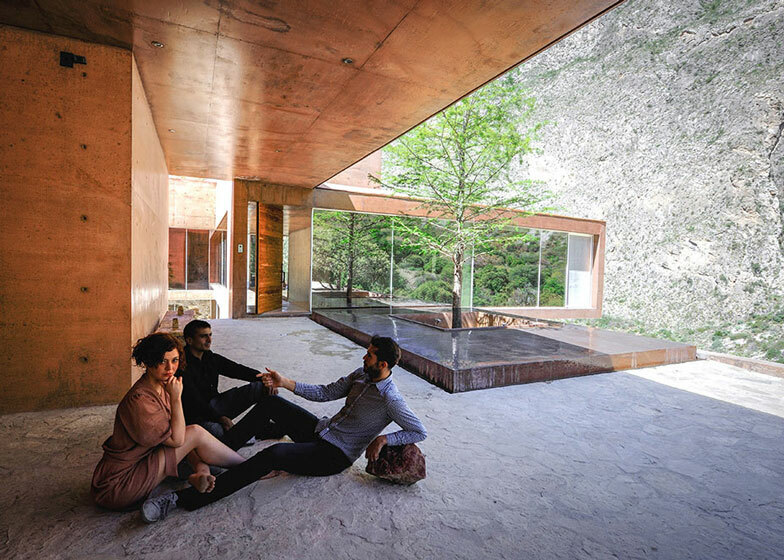 To avoid disturbing existing trees and to contend with the uneven terrain, David Pedroza Castañeda designed the residence as a cluster of three two-storey blocks that step back and forth across the site. 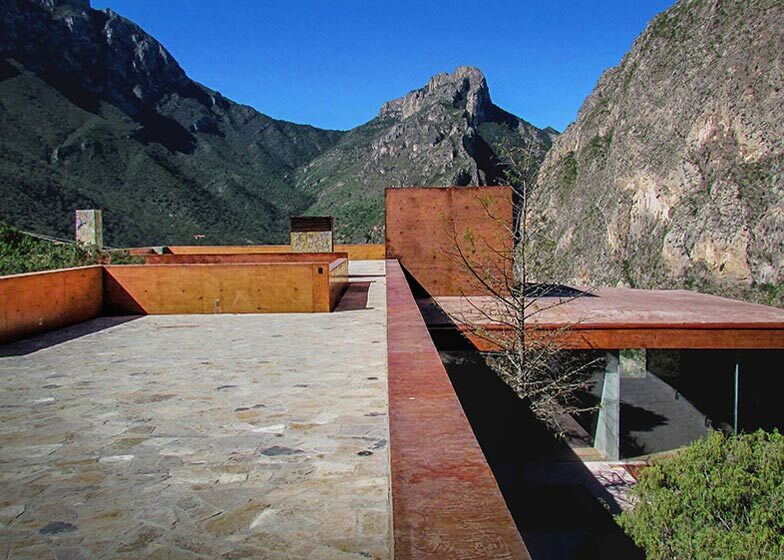 "This mountain-enclosed neighbourhood reminds us of numerous Mexican towns where tall mountains limit the valley where its inhabitants settle," said Pedroza Castañeda. "Residents live alongside the typical vegetation and wildlife." 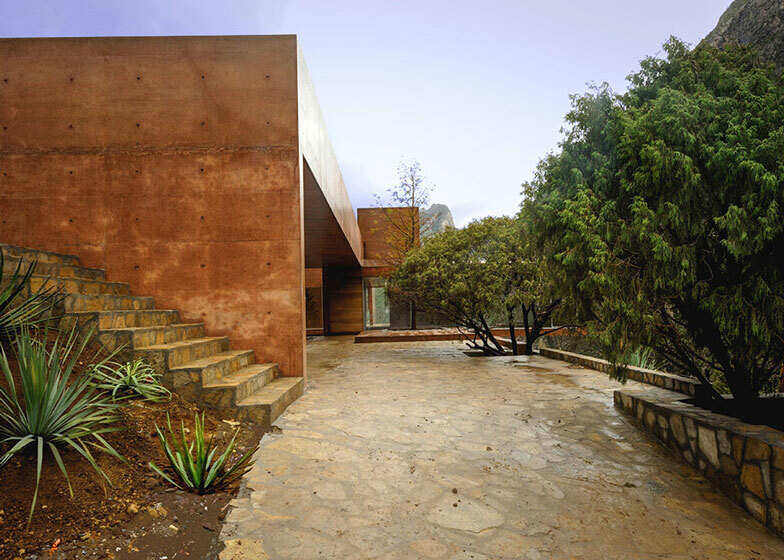 Pigmented concrete gives the house an earthy red colour that matches the tone of the groundscape. 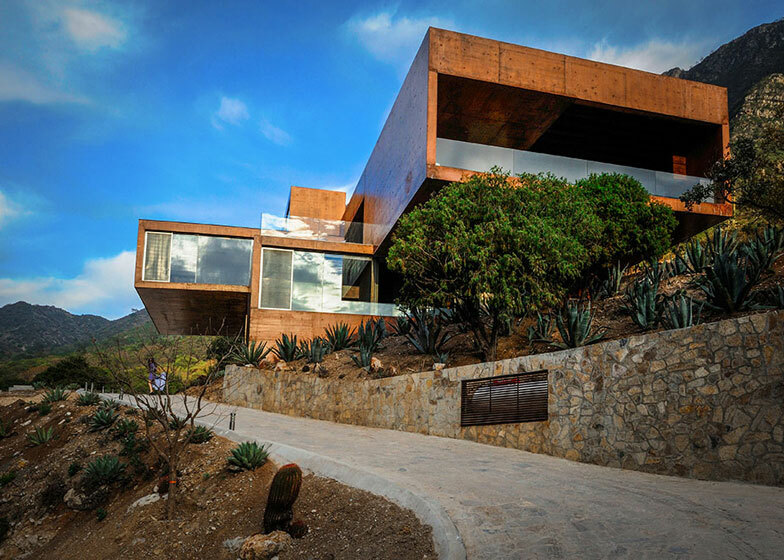 This is married with Mexican cypress beams and hardwood floors, as well as floor-to-ceiling windows that frame panoramic mountain views. 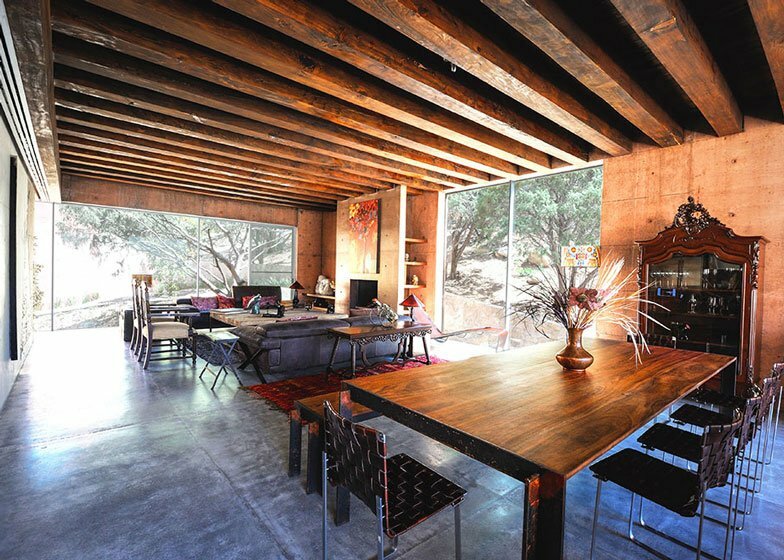 "The material palette gives the project a rustic, timeless appearance that serves as background for various objects," said Pedroza Castañeda. 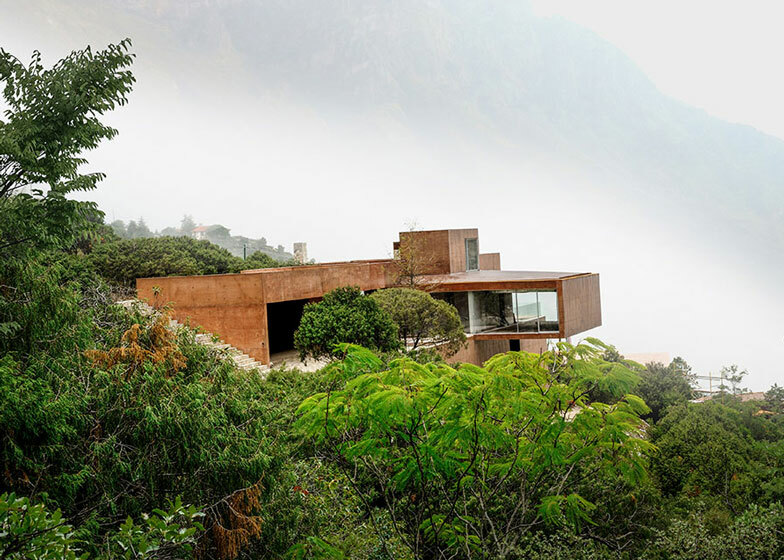 "The coloured walls and enormous floor-to-ceiling windows reflect the landscape and make the house disappear. When seen from a distance it is easy to mistake Narigua for a geological accident," he added. The first of the three volumes accommodates a parking garage and storage areas. The second contains the entrance and the client's bedroom, while the third is occupied by living and dining areas. These spaces are furnished with a mixture of modern and antique furniture, interspersed with artworks that include paintings, sculptures and decorative masks. Several multi-purpose rooms are located on the level below, creating space for guests to stay. Stairs also lead up onto the large flat roof, which offers residents an expansive terrace. 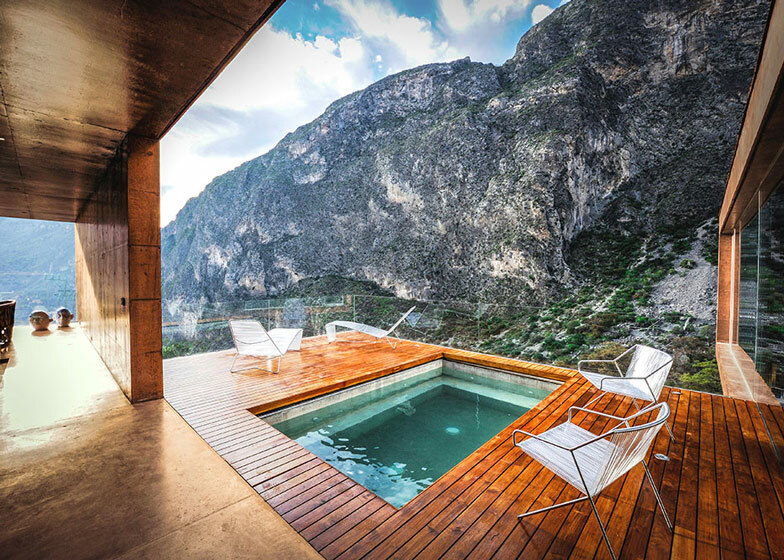 We find Narigua House in "El Jonuco" a beautiful place where we enjoy from 360 degrees of spectacular views. This mountain-enclosed neighbourhood reminds us of numerous Mexican towns where tall mountains limit the valley where its inhabitants settle. 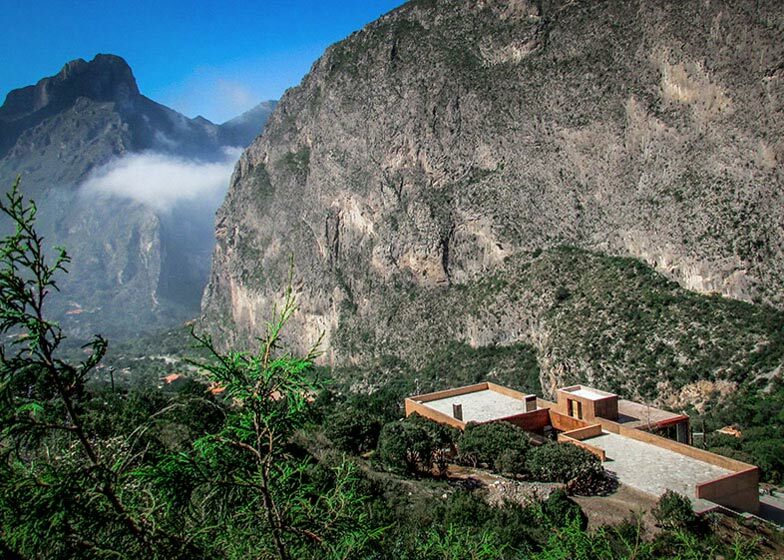 Here, its residents live alongside with the typical vegetation and wildlife found in northern Mexico. 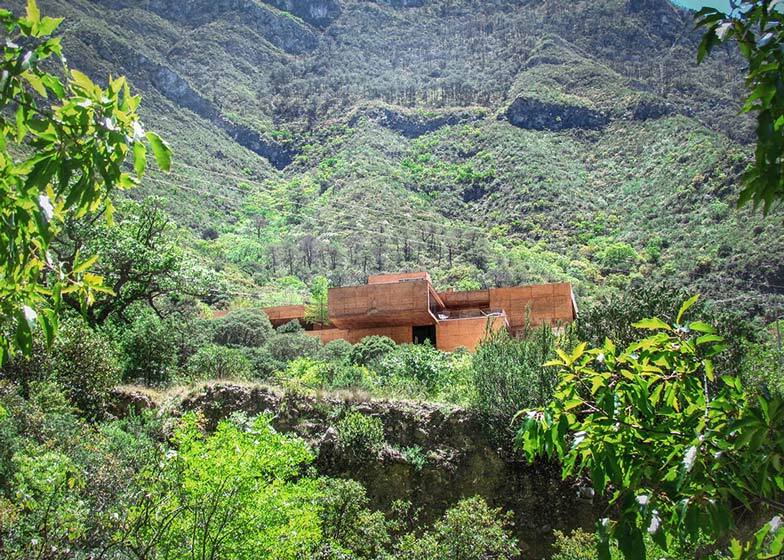 The site is densely populated by local trees that pose a serious design challenge: A house that enjoys the view of the mountains while respecting the existing ecosystem. Because of the horizontal growth of the cedar trees that block the view, a "forest of columns" is not an option. The only possible solution is to lift the house and make it fly above the tree tops. A mild slope road reaches the ground floor, 10m above the road, where all the essential spaces are located. 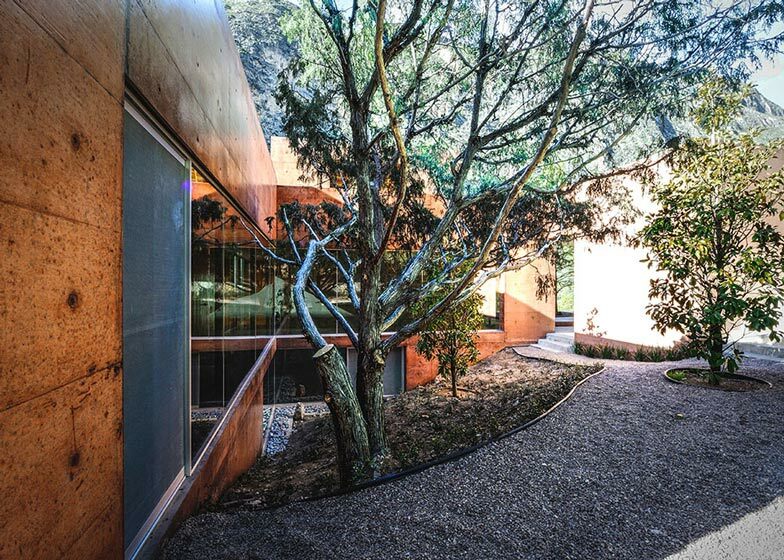 To preserve the existing greenery the floor plan is divided into zones that get around a group of old cedar trees. Because each level responds to different conditions each plan, in itself simple, is different to the others. The building is divided in three different volumes. The first one contains the garage and storage spaces. The entrance hall, master bedroom and the staircase to the lower level are located in the second volume while the third volume contains the kitchen, service and social areas. 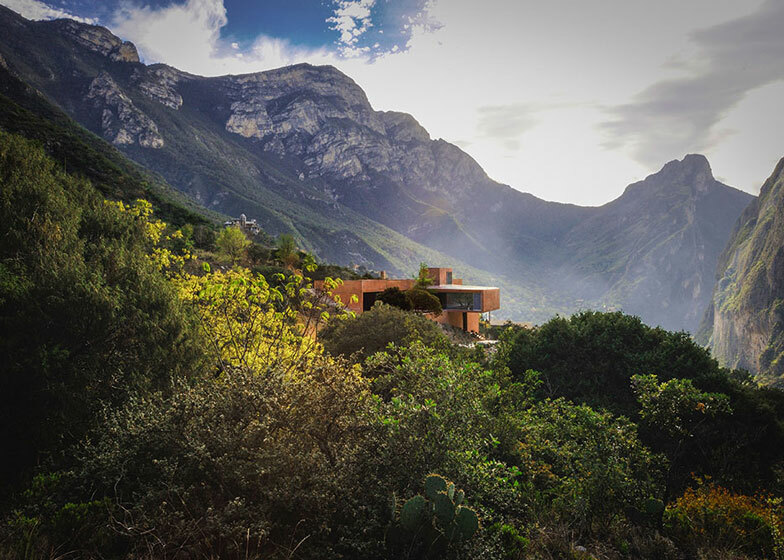 Outdoor life occurs on the west side of the house in a group of terraces that overlook the focal point of the residence: two spectacular mountains that almost touch. The lower level serves as a plinth for the ground floor and contains a number of "recyclable" chambers with furniture that allows them to transform into the guest bedrooms. This floor also contains two half-buried technical rooms that free the rooftop to enjoy an enormous belvedere surrounded completely by the landscape. 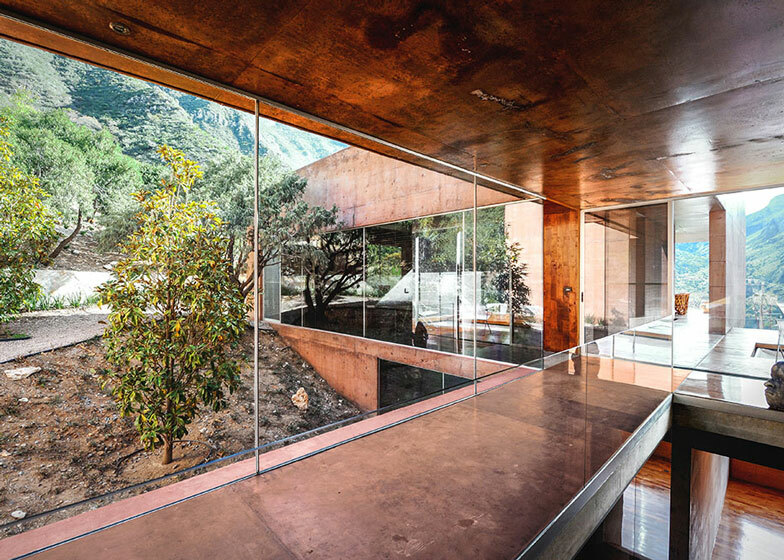 Contrary to its massive exterior image, inside the house the transparency of the glass makes the exterior views part of everyday life. 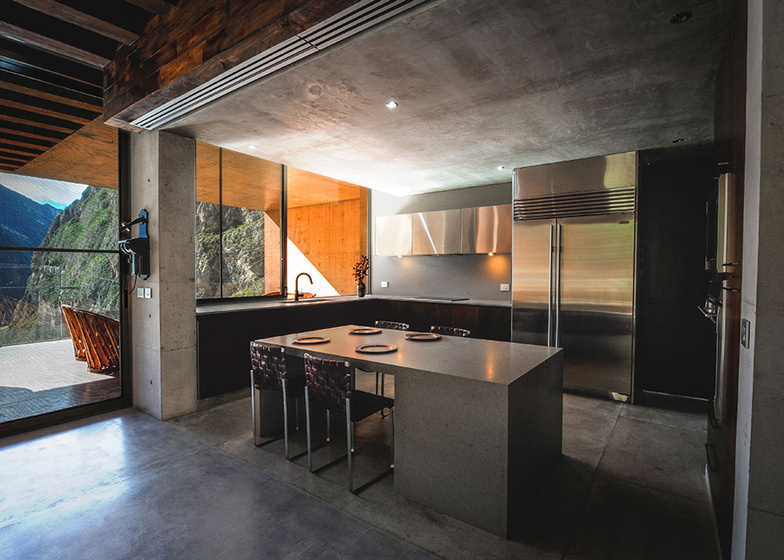 Windows dialogue with thick walls, flat roofs and the timber beams we find in traditional Mexican architecture. The material palette gives the project a rustic, timeless appearance that serves as background for various objects. Antiques live alongside with contemporary furniture while the parallel world of paintings, masks and sculptures claim our attention. The house's treasures allure our eyes to stay inside before escaping to the natural scenario on the other side of the glass. The different elements of the program, placed in a juxtaposition of volumes define the complex image that emerges from a simple distribution. The coloured walls and enormous floor to ceiling windows reflect the landscape and make the house disappear. When seen from a distance it is easy to mistake Narigua for a geological accident. The roads and walls are paved with the stones of the land and the colours of its dirt, its form contrasts with the mountains and trees. 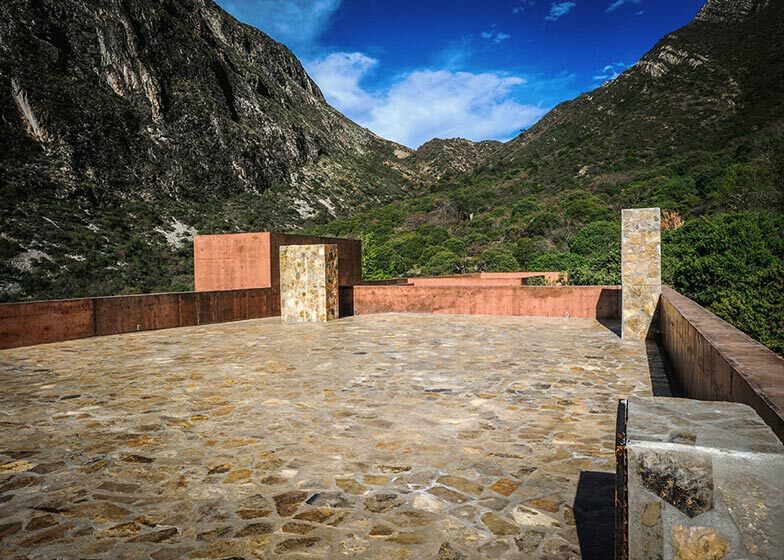 Narigua House is a stone work humbly placed in an impressive landscape.